The war against the Soviet Union was described by the leaders of the Third Reich as a ‘Weltanschauungskrieg’, that is, a war of ideologies. 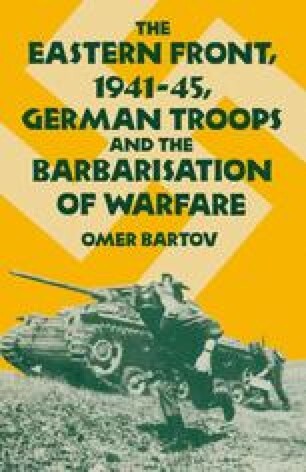 In seeking the causes for the barbarisation of German troops on the Eastern Front it is therefore essential to examine the role played by political indoctrination among the combat elements of the army during the war. To what extent did National Socialist ideology motivate the individual soldier both in fighting the Red Army and in carrying out acts of brutality against POWs, partisans and civilians? Was there an essential difference between the war in the East and other fronts or other wars? In short, was this also an ideological, almost religious war from the point of view of the individuals at the front, and can this be seen as one of the major factors contributing to its ferocity and brutality?